Quality Engine, the administrative measure logic and systematic sample processing component of Cotiviti's Quality Intelligence solution, has earned Healthcare Effectiveness Data and Information Set (HEDIS®) Certified Measures? status from the National Committee for Quality Assurance (NCQA). Cotiviti (formerly Verscend Technologies), a leader in data-driven healthcare solutions, has earned this certification for the 18th consecutive year. NCQA certification validates that measures have been put through the thorough testing required to effectively support health plans with the 2019 HEDIS reporting season. "Quality Intelligence processes data for 68 percent of health plan members for whom HEDIS scores are reported. Therefore, we have a critical responsibility to ensure that our HEDIS software measures meet the highest standards as soon as possible," said Dr. Emad Rizk, president and CEO of Cotiviti. "Our team has an unbroken track record in achieving NCQA certification early in the HEDIS season, which gives our clients a quality analysis, improvement, and reporting edge. Cotiviti's operational excellence and precision offer our health plan customers peace of mind during this very demanding time of year." HEDIS is the measurement tool used by the naton's health plans to evaluate their performance in terms of clinical quality and customer service, offering a standardized set of performance measures designed to ensure that purchasers and consumers have the information they need to reliably compare the healthcare quality of various health plans. Rated as a top-three solution by KLAS Research in both 2017 and 2018, Quality Intelligence combines NCQA-certified measure logic and easy-to-use reporting software with high-volume, expert medical record retrieval and abstraction services to drive the best results with the least amount of health plan effort at every step. Cotiviti has required only two measure recertifications for Quality Intelligence in the past three years, minimizing the potential for any client inconvenience. Enabling payers to measure and report HEDIS and HEDIS-related metrics with flexibility and insight, Quality Intelligence forms the solid foundation of an effective quality improvement program. Health plans can track, monitor, and improve quality compliance; develop and measure proprietary quality metrics; facilitate HEDIS, Star Ratings, and other quality measure submissions; and implement a year-round measurement and reporting program that significantly improves their rankings. Medicare Advantage plans can further benefit from Star Navigator from Cotiviti. Built on the proven Quality Intelligence platform, Star Navigator helps Medicare Advantage plans determine the most direct path to higher Star Ratings, then track and communicate their progress toward goals. Tight integration between the two solutions enables easy population of provider and member dashboards and reduces health plan IT support needs. 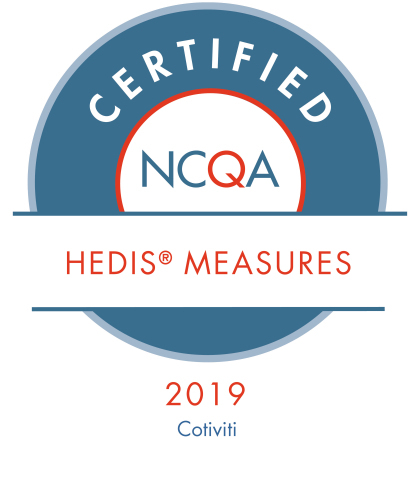 HEDIS® is a registered trademark of NCQA. HEDIS Certified Measures? is a service mark of NCQA. NCQA Measure Certification? is a service mark of NCQA. Cotiviti is a leading solutions and analytics company that is reshaping the economics of healthcare, helping its clients uncover new opportunities to unlock value. Cotiviti's solutions are a critical foundation for healthcare payers in their mission to lower healthcare costs and improve quality through higher performing payment accuracy, quality improvement, risk adjustment, and network performance management programs. The company also supports the retail and life/legal industries with data management and recovery audit services that improve business outcomes. For more information, visit www.cotiviti.com. NCQA is a private, non-profit organization dedicated to improving healthcare quality. NCQA accredits and certifies a wide range of healthcare organizations. It also recognizes clinicians and practices in key areas of performance. NCQA's website contains information to help consumers, employers and others make more informed healthcare choices.